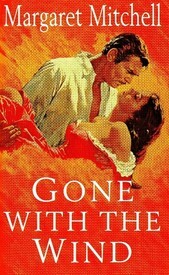 Margaret Mitchell’s only published work, Gone With the Wind, is a novel of massive proportions. Not to be confused as an out-and-out love story this historical saga spans the years of the American Civil War and the period of Reconstruction and traces with it the life of Scarlett O’Hara. What brought me to Gone With the Wind is hard to tell. A solid resolve of reading almost everything I could lay my hands on, perhaps? Or chance? I am yet to know. But the troughs and crests of Scarlett O’Hara’s life became a story I read avidly for many days. Some days I woke up thinking, what is she going to do next? On others, I found myself intoning her famous charm, “I shall think about it tomorrow.” Scarlett O’Hara’s hugely (in)famous name and her persona are all very well worth the adulation. After I finished the book, she seemed to me a person as real as me and you. The 1000+ page novel starts with the line “Scarlett O’Hara was not beautiful, but men seldom realized it when caught by her charm…” What starts off as the story of a green-eyed girl who can’t wait to marry one of the many beaux she has, winds up as a tale of a woman who has nothing left but herself! Spanning 12 years of Scarlett’s life, Gone With the Wind is the locus of Scarlett’s journey to finding herself in a diametrically opposite situation from where she started out. It is safe to say that Scarlett is the focus as the story weaves all the characters around her through her own self. How everyone’s lives are woven with Scarlett’s is why one would call Scarlett the hero/anti-hero of the book. When it reaches Scarlett’s ears, in the first chapter of the book, that her darling Ashley will be marrying Melanie, she devises a plan to ensure that Ashley elopes with her instead. Dressed in her finest she sets out for Twelve Oaks to reclaim what she thinks is hers. When Ashley refuses to marry her, she is convinced that he is doing so because he couldn’t go back on his word to Melanie and that he still loves her. On the day of the announcement of Ashley’s wedding to Melanie, war is declared against the Yankees. Following the speedy wedding of Ashley to Melanie and a hasty decision later, Scarlett marries Charles Hamilton, Melanie’s brother. A short marriage and a child later, Scarlett finds herself at crossroads with Ashley once again; her love not dimmed and her spirit not crushed. With the war underway, a widowed Scarlett moves to Atlanta to stay with her sister-in-law Melanie and Aunt Pitty. While all the men are at war, a dispassionate Scarlett wants the parties and grandeur of Southern living back in her life. Not to be caged as the widow of a man she never loved, Scarlett finds ways to leave the house even if it means working at the hospitals nursing the wounded from war. What spans thereafter is the beginning of the period of self-assertion for this obstinate, pampered belle from Georgia. Margaret Mitchell has painted vivid sketches of the war and its effect on the Southerners. She has brought the reader nose-close to the effects of war on common man. By describing the scenes of the households whose men are at battle, to the situation of plunging resources needed for soldiers, and the aftermath of terribly losing a war, Mitchell has not only magnified war times to a reader, but also shown how human mindset changes in trying circumstances. On one hand you have men claiming that the Cause of the war is worthy and noble but on the other there are those who have their reservations, Scarlett included although not outspoken. Ashley even, but too timid to admit. And then? Then there is Rhett Butler, the soldier of fortune who, with his notorious reputation, never misses a chance to criticize the Cause and the foolhardiness of the Southerners. Rhett Butler enters Scarlett’s life obtrusively and unapologetic. His ability to say things people are thinking but would never admit aloud makes him a character to look up to. How Rhett Butler meets out honesty to the honest and crafty to the cunning is worth noticing. How Rhett sees through Scarlett and how she slowly finds herself needing him more than ever is predictable. However, the conversations Rhett and Scarlett have are entertaining to read. They are all, undoubtedly, high points of the book! While the South is impounded with misfortunes of losing a battle and is dealing with policy reformations, Carpetbaggers and Scallawags, Scarlett and her family are dealing with their own losses. The loss of houses, their pride, food, security and family members. As the novel progresses a determined Scarlett resolves to survive the destruction that the war caused on her life in ways unappreciated by the society. One feels proud of her for taking matters in her own hands, but one also wonders if her theory of ‘the ends justify the means’ is truly noble. Gone With the Wind is rife with a spectrum of human emotions; the carefree attitude of youth, the fear of death, the tenderness of motherhood, the faithfulness of friendship and the trust in old relationships. And of course, there is love in this book; of all kinds. Unwavering love that Melanie has for Scarlett. Love for materialistic gains that Scarlett has for money. Love of an understanding kind that Rhett Butler has for Scarlett. Love of a non-comprehensible nature that Scarlett has for Ashley. One can say that the character of Scarlett O’Hara grew from a carefree belle to a weatherworn woman, however, I disagree. I never saw her growing in terms of acceptance, but only in terms of strength. At the beginning of the book, one imagines Scarlett to have a fierce personality one that she was never aware of. At the end of the book, one sees Scarlett to assert her fierce personality in every way possible unmindful of anything else. Although, she underwent all phases of life, I wonder if it really changed who she was. Admirable as it is to see how one guards their own self in spite of life’s trying odds, it beckons to wonder if unchanging is a good thing at all. Finally, I think one must find time to read this gigantic book. It’s a well-rounded story of many facets and is thoroughly entertaining as well. Because for one Scarlett there is a Melanie. For one Ashley there is a Rhett.